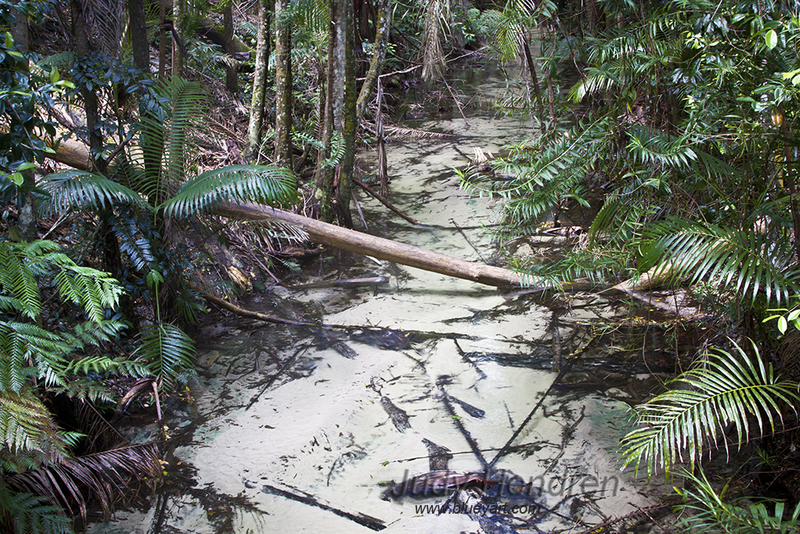 Category Archives: Fraser Island, Qld, Aust. A Day on Fraser Island, Queensland, Australia. Up at 4.45 am had a breakfast and be waiting at the gate for pickup at 6.30 am. It is still raining very hard but will still enjoy. 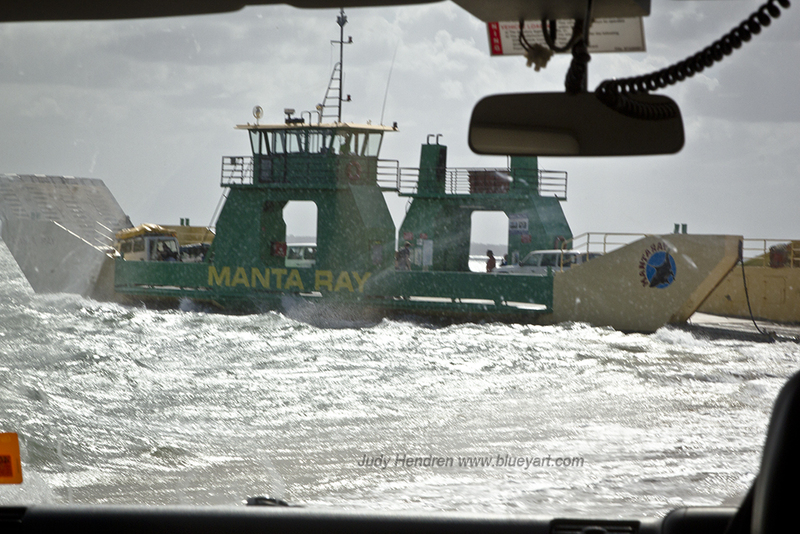 We had other people to pick up on our way to Inskip point where we drive onto the ferry. 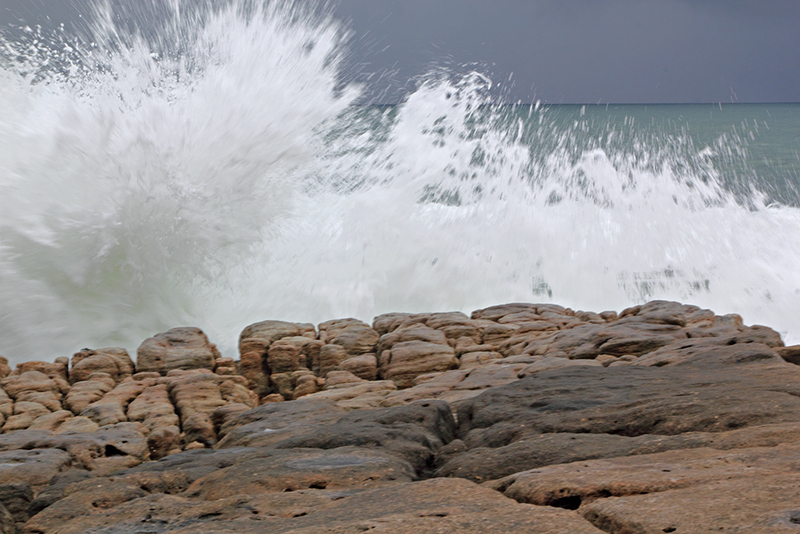 The tide was so high we could not drive up the Rainbow beach, may do it on our way back they said. The back roads we went on and the forests we drove through are really lovely even in this rain. At Inskip we had a pit stop some people grabbed a bite to eat then we headed for the 1 km drive along the sands to board, the sea’s are very rough, windy and awesome. It was a rough crossing but fun. 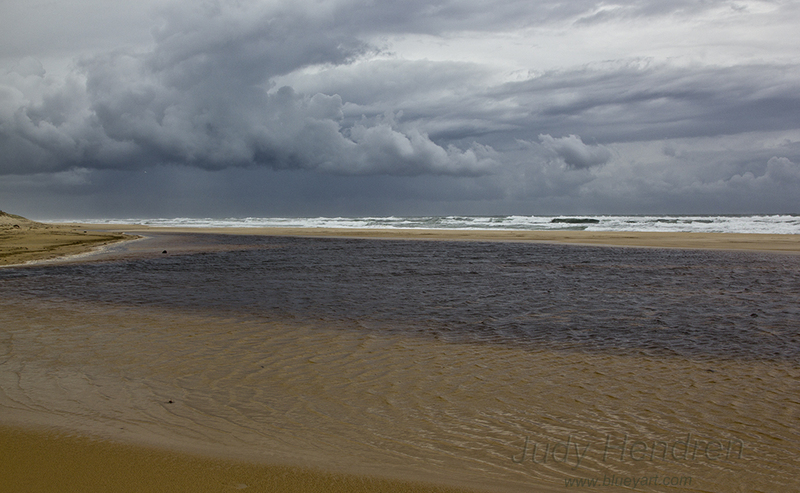 This was the view from our wee smoko break on Fraser Island. We drove on up the beach then headed for Lake McKenzie through sand tracks and rainforest, pristine creeks, all so pure and natural. This is Sam getting lunch ready for us all, the weather was real grotty but no problem for Sam and the spread he put on was real nice, plenty of food for every one, even catered for Gluten Free diet. Pristine waters, it is so hard to tell if there is water in this creek but it is so pure and clean, like a spring as it is filtered through the sands. You can see it bubbling up in places. It was a rough crossing going back as well but what a fabulous day. 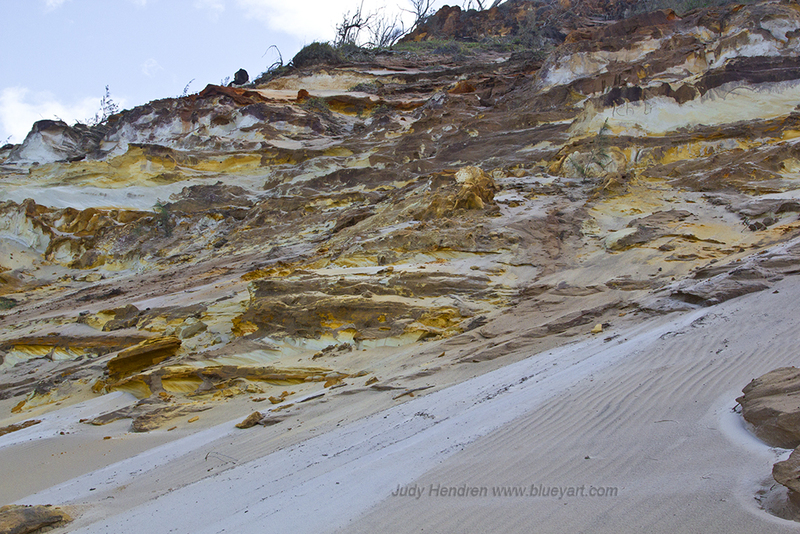 This is the Rainbow coloured sands at Rainbow Beach, The rest of the trip went real good and the Lake was lovely but to wet to get photos, some very steep country on the Island and we only saw a fraction of it, I will be going back at some later time. 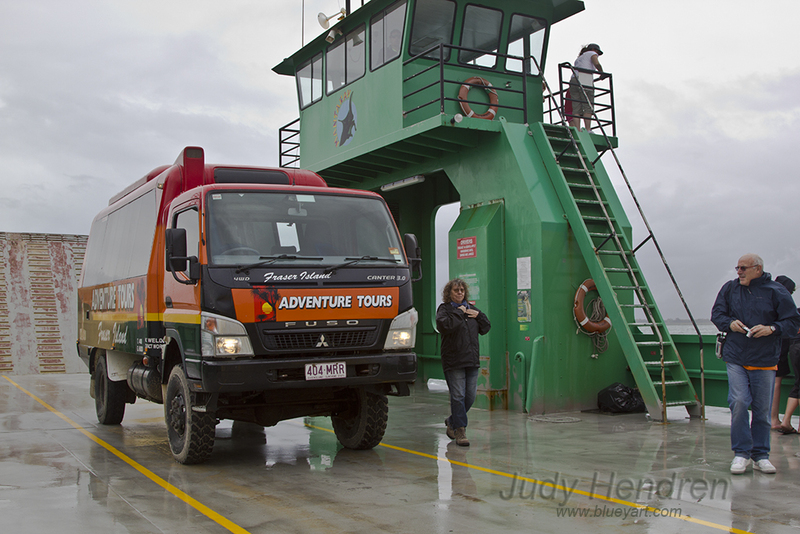 The history that goes with Fraser Island is incredible and interesting. 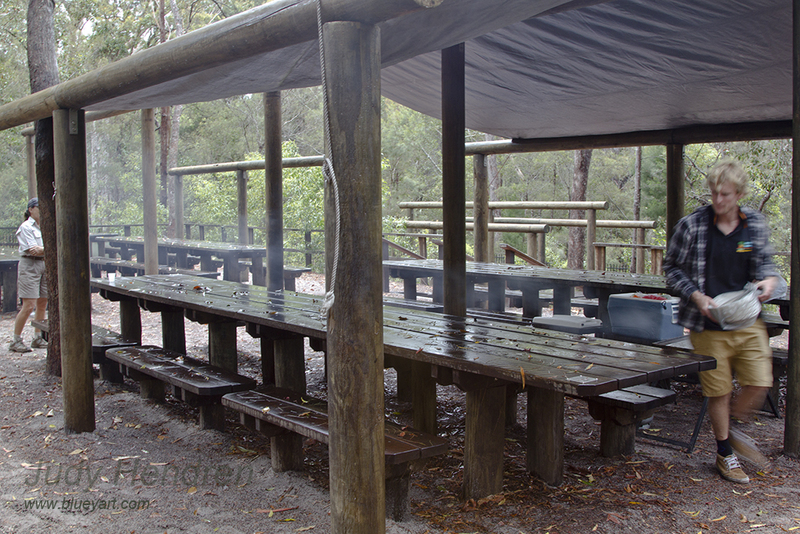 We left home at 3.30 pm to go up and stay in the Noosa Caravan Park, got there by 5.15 pm. Got settled into the cabin and had tea, weather was not looking good at this stage for our Fraser trip on Sunday, never mind. Got to bed early. Woke up to hearing rain and it’s been raining most of the night. Got breakfast sorted, packed food for our lunch and got our camera gear ready with plastic bags to keep them dry as we are heading for Arkwright Point to get some photo’s. Well that’s the plan. Nice surprise, get to Arkwright and the rain stopped, we had a cuppa then headed down the beach, skies are dark, ocean rough, beautiful. 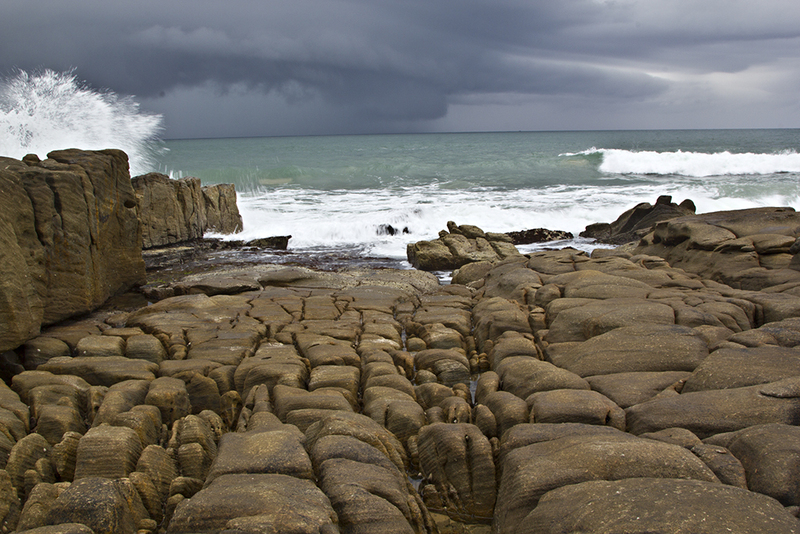 Arkwright on the Sunshine Coast, beautiful storm coming in. No this wave did not get me, but was close. We packed up as the storm was getting to close so by the time we got back up to the car park, had our lunch and down the rain came. It looked like it was setting in so we headed back to the caravan park. Settled in for a restful afternoon. Early to bed as we are having to have a early start tomorrow.